Lunar New Year Celebration on Madison Avenue! 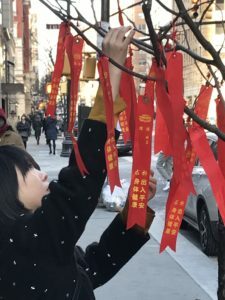 Madison Avenue celebrated the Year of the Pig by creating a “wishing tree” on Madison Avenue between East 62 and East 63 Streets. Since ancient times, hanging wishes on “wishing trees” for the New Year is synonymous with luck and good fortune, and is believed to encourage dreams to come true. And they will come true on Madison Avenue! 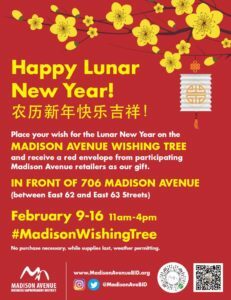 From February 9-16, the public was invited to place a ribbon with their wish on a branch to receive a traditional red envelope containing a gift certificate from a participating Madison Avenue retailer. Guests received their ribbons at participating retailers and at the information table next to our wishing tree. No purchase was required. This “Madison Street to Madison Avenue” event was a collaborative effort with the Chinatown Partnership (home of Madison Street) and the East Midtown and Grand Central Partnerships.